This is a sponsored post written on behalf of Mean Green all opinions are my own regardless of compensation received. I received product and monetary compensation to facilitate this review. With summer here in Kentucky it is time for sprucing up the home and landscaping after the harsh winter months have taken their toll. One of the main things we do every year is make sure we clean the siding on our trailer. Cleaning our homes siding is a simple, cheap home improvement we make every year! We save a lot by not calling in a professional and our home looks amazing afterwards! A diligent spray with Mean Green and rinse with the pressure washer makes a huge difference and saves time and money. COVERS MORE SURFACE AREA THAN OTHER BRANDS: CLEANS 7500 SQUARE FEET! 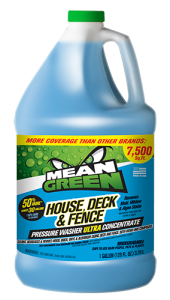 Mean Green's House Deck and Fence Pressure Washer Ultra Concentrate is perfect for cleaning siding. Our house gets this green residue each year a mix in my opinion of mold and mildew after the winter months. It dulls the luck of our home and really makes it less bright and dingy. The easiest and cheapest fix is to use your pressure washer and spray it down with Mean Green House Fence and Deck. To really make it clean and look well sometimes it takes multiple treatments depending on the amount of grime on your houses siding. This is our siding before cleaning with Mean Green House Deck and Fence. 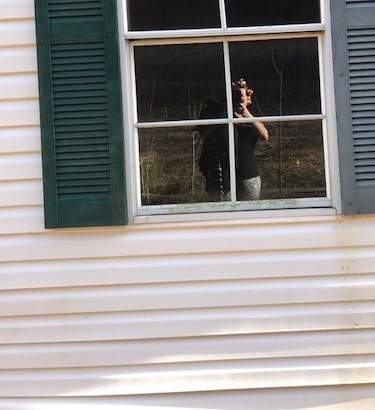 We simply sprayed down the siding using our pressure washer filled with Mean Green House, Deck and Fence Pressure Washer Ultra Concentrate using the directions on the bottle. The directions are simple to follow and make cleaning siding a simple DIY job that can save you a lot of money. This spot pictured above was particularly bad as a tree sets near this part of our house and leaves a lot of this green mildew collection on our siding in that spot. The next photo shows after one treatment with Mean Green House, Deck and Fence the difference it makes! We were on our way to a shiny, new siding but thought it needed one more spray down. 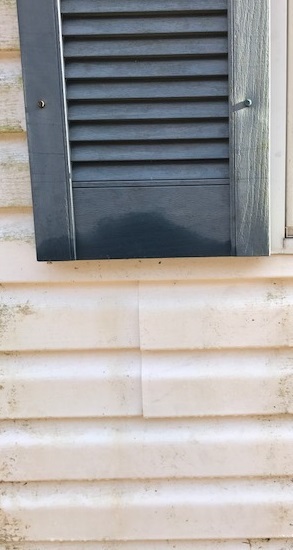 This is one of the worst spots pictured above that our siding had. The below picture is after the second and last treatment. That second treatment worked wonders our siding looks almost as new as the day we got the trailer! We are able to save hundreds of dollars each year with a little work and Mean Green House, Deck and Fence by cleaning our own siding. Professionals can charge hundreds for this same service and it is a simple DIY project anyone can do! Not only does your siding get a great clean up but your entire property looks better with clean siding! Mean Green House, Deck & Fence Pressure Washer Ultra Concentrate was developed to clean, degrease, and revive wood, brick, vinyl & aluminum siding, stone, stucco, gutters, roofing, deck & fence, both wood and composite. Use Mean Green to remove stains caused by mold, mildew, algae, moss and fungus, grease, dirt, oil, acid rain, tree sap, and bird feces. The ready to use, concentrated formula does it all! Also if you do not have a pressure washer use a little elbow grease as Mean Green House, Deck and Fence can be used with pressure washer equipment or manually to clean many exterior surfaces. No job is too big or too small for Mean Green!